It was so thrilling to attend #ESCAPE2016. How wonderful the BAG IT organization is committed to combining patient advocacy with self discovery. meditation, group exercises, meetings about effective lobbying, running non-profits and even a special Indian dance. I went to Escape seeking solutions to balance my personal and professional passions. I discovered I hide my ongoing complications from this disease, because so many of my close friends with stage IV are being ignored and facing much more difficult circumstances. I want to save everyone from the scars of cancer. I have lost so many family members and loved ones to this disease. The desert was beautiful, but a little warm this time of year. With a no cell phone policy at Miravel Resort, it was nice to not feel so absorbed by the 100’s of tweets, FB posts, texts, and emails, as I tried to balance the great conferences with classes and even group meditations in pods! I loved that it was a small mix of all kinds of cancer advocates. There was healthy food, meditation, and networking. We had an amazing talk from Shelley at the NCCS where she talked about how we influence policy. I hope to go again next year. I was fortunate to meet some great people and partake in combining advocacy with self discovery. Patient advocates (especially volunteers) need this type of balance. The burn out factor is real especially when passions are high, time is of the essence to save lives and yet all of us must remember to stop, take a breath, and try to be in the moment especially when the body and mind are filled with stress. It’s also important to put our personal health first. No matter what stage or complications one has from any cancer, loved ones helping, medical professionals, patient advocates, researchers, and doctors, we are all in this together. We must respect each other and try to move forward. My own personal side effects have slowed me down sometimes, but it’s time we allow ourselves to feel. I also realized that I have been dealing with a lot of grief. Thankfully I was surrounded by awesome people. During many of the special meditative and group activities, I found myself quite emotional. I do believe that when it comes to cancer there’s so much emotional pain, physical changes, highs and lows, and some very tough times because of the incredible toll this disease can take. Thank you to the sponsors who help bring Escape2016 to patient advocates. I came home so much more refreshed and ready for the tasks ahead that keep this new balance. It’s important to take time for reflection and always be mindful of making sure we keep taking care of our selves, while content to push forward helping others. We are pleased to announce the success of our newly implemented scholarship program. We awarded two amazing women, Jennie Grimes and Grazia De Michele paid scholarships thanks to our generous donors at Advocates for Breast Cancer (A4BC). Grazia De Michelle – an Italian born woman currently living in the UK.was diagnosed with breast cancer in 2010, at the age of 30, and has been a patient advocate ever since. She was treated in Italy where, unlike the United States, breast cancer advocacy is still in its infancy and the level of patients’ engagement with researchers and healthcare providers is low. 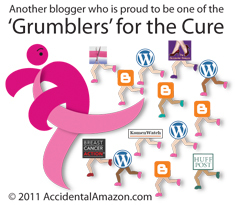 As a result, at the end of active treatment, in 2012, Grazia started her blog, Le Amazzoni Furiose (The Furious Amazons), to promote Italian women’s involvement in the international debate on breast cancer. A year later, she joined the Breast Cancer Consortium, a network of scholars and advocates interested in breast cancer, critical health-literacy and evidence-base medicine founded by medical sociologist Gayle Sulik. 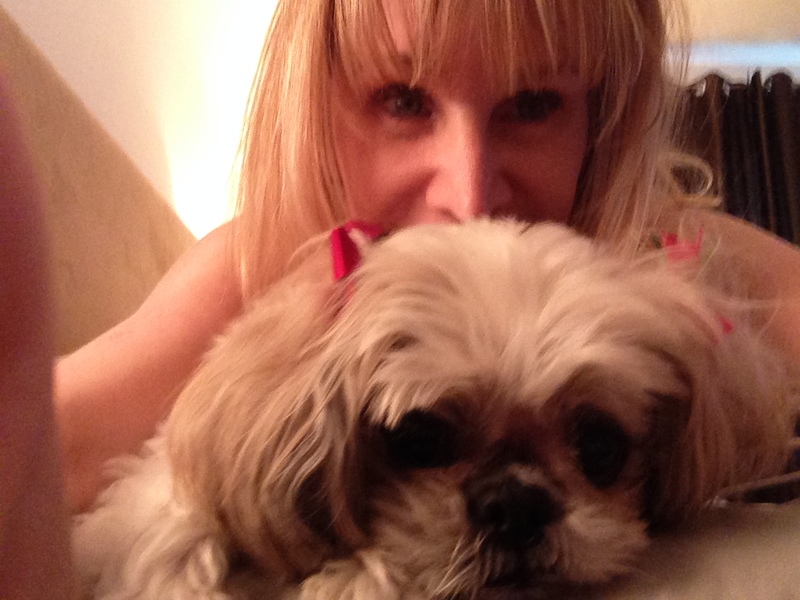 Jennie Grimes – a metastatic breast cancer (MBC) patient is literally dying for a cure. She is 35 years old, going through a rough time because there are limited choices of drugs to keep her alive. 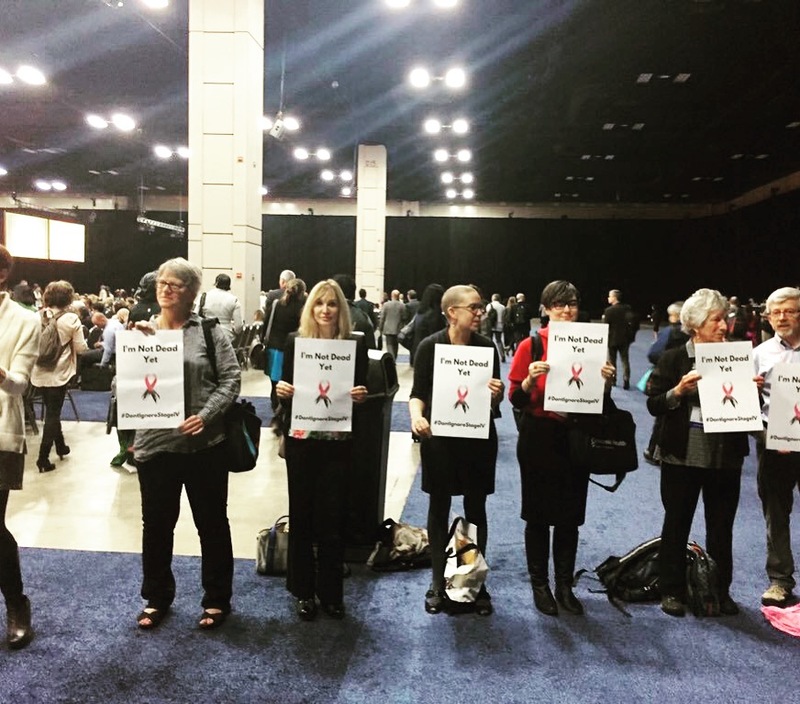 She asked the professionals at #SABCS15, “please keep me alive.” My heart is breaking because I wish there was more available for her and so many others dying of stage IV breast cancer. The most exciting part of the symposium was (A4BC) joining with other organizations that are working toward the same mission. 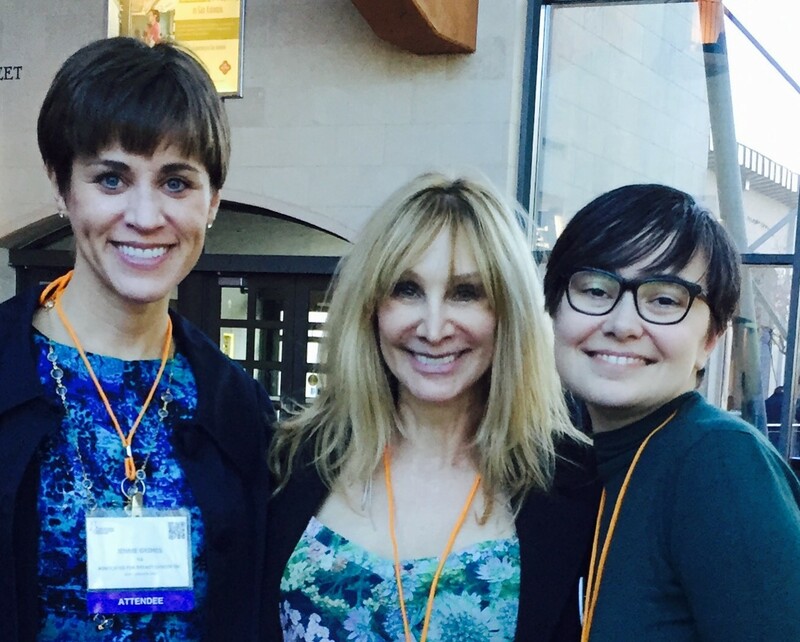 We met with Beth Caldwell, mother, wife, cancer patient, METUP co-founder, and blogger. Meeting people that we know through social media and being able to interact with them is so meaningful because we are able to join forces to save lives. We also met Corrie Painter PHD who along with NiKhil Wagle, MD is working on the MBCProject.org. They believe in sharing the data. This is a whole new way of approaching research. The truth is that when it comes to breast cancer, we are in an epidemic. Over 40,000 women and 400 men die each year in the U.S. alone from Metastatic Breast Cancer. This is the same number of deaths in the U.S. that occurred during the height of the AIDS epidemic. So while many breast cancer organizations use pink marketing to raise money for a cure, the reality is they just keep saturating the public with the idea that breast cancer is a pretty pink disease with survivors. Many people did not understand why we are demanding that Stage IV needs more focus; too many women (and some men) are dying. What we’ve done in 25 years has not had much impact on the death rates. We must prioritize our efforts to save lives. If we could finally understand why someone gets breast cancer, like we understand how AIDS is spread, it would be a huge help towards finding life saving treatments and prevention. Last night, I lay in bed and couldn’t sleep. I didn’t know that my dear friend, Krysti Hughett, drew her last breath just an hour before. Maybe my body and soul could sense it. Krysti passed away on July 7, after more than 10 years of beating the odds of very aggressive stage IV inflammatory breast cancer. She accomplished such an overwhelming task with her determination, incredible intelligence, and tender love and support she gave to others. Yet I can feel her presence as if she was still here. And in a way she is. It is no coincidence I met Krysti while she was helping others. It was about six years ago, and Krysti was leading a Young Survival Coalition (YSC) support conference call for stage IV breast cancer survivors. I was fairly new at the game and nervous about reaching out for help. It was then that Krysti earned the moniker I gave her – “resource queen.” She told me about a magical place called Camp Kesem and suggested my daughter would like to attend. Her own daughter Molly had been going and loved it. I signed Chrissy up for that summer and she and Molly (AKA camp name Mo Mo) became cabin mates and fast friends. We’d meet up with Krysti and her husband Bill at camp and have dinner afterward. It became our tradition. Krysti was my mentor and friend. She let me in on so many cancer perks I’d otherwise would have not known about. In addition to Camp Kesem, there was a wonderful mountain retreat weekend through an organization called Image Reborn. You better believe I took advantage of that and passed it along to my breast cancer friends. Krysti was also my inspiration and fountain of information for clinical trials. Krysti, I found, knew more about them than many of my doctors. It extended her life and many others she so freely advised. I once told her she should get paid for the hours upon hours of consulting she provided for so many people. She shot me down of course. Krysti gave with love; money had nothing to do with it. Every year we met at Camp Kesem, Krysti would joyously announce that she made it another year to see Molly go to camp. She loved that place, and she loved her girls – Molly, Mindy and Megan. We had a special relationship, but I knew I shared her with so many people who also had a special relationship with this remarkable lady. As she said in her final note, she was loved. Last Thursday, I went up to Indianapolis with my friend Joules Evans for my scan and blood work for my upcoming clinical trial. Afterwards we stopped in and visited Krysti who was at a nearby hospital. We were among many people who gathered at her bedside. Krysti was struggling to breathe but took off her oxygen mask so she could talk to me. I instinctively stroked her head as she labored to speak. I asked if I was bothering her but she assured me it felt very good. I wanted to give back some of that love and caring she so generously shared with me. We reminisced how we met, and she wanted to know about my clinical trial. Her mind was still sharp as ever and she let me know it sounded promising. I told her I loved her very much and she said she loved me. There seemed to be little left to be said, but as I turned to head out the door, she had one thing to say to me. “Please let everyone know how you’re doing on your trial.” She wanted me to keep in touch with her family and friends. And I suspect, that she will be listening from above as I give my updates. I know on some deep level that Krysti is watching over me and everyone she has loved. She is just next door, in another dimension, but is still helping everyone. I can feel that right now as I write this. Krysti’s legacy lives on, and I’m grateful to play a small role in that. Her story is one of the many featured in my book, Miracle Survivors: Beating the Odds of Incurable Cancer. I know Krysti would want you to read it because her story is so encouraging, just like she was in her life. legacy Krysti leaves behind. Your body may have expired; but your spirit will forever be with us. Her new book called Miracle Survivors: Beating the Odds of Incurable Cancer, was released in November 2014 .You will find all new stories, but Tami again says “it’s the same message: there is hope no matter what the circumstances. 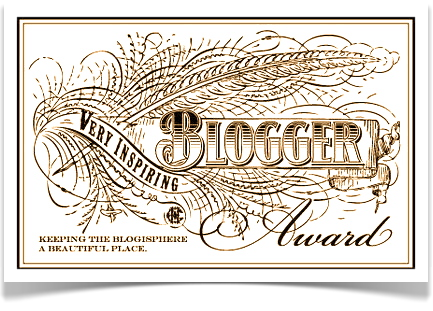 I truly feel empowered by the amount of love and understanding that I am receiving from my family and good friends as a result of blogging my true thoughts and emotions. I am so uplifted by all the love and support coming my way. After facing my fears and shedding many tears, there is plenty to be grateful for and inspired about. My fearless friend is strong as an ox. She makes me laugh and my time with her is wonderful. Although she had a very rough week, the treatment is working. She is optimistic and so am I. While still depressed, I am confident I am on the road to recovering from it. With the incredible help of my family and friends, plus tons of resources, all will be well. Some days everything looks bleak. But life is full of surprises. I am not alone. It’s time to throw away the pity party and look towards the future. 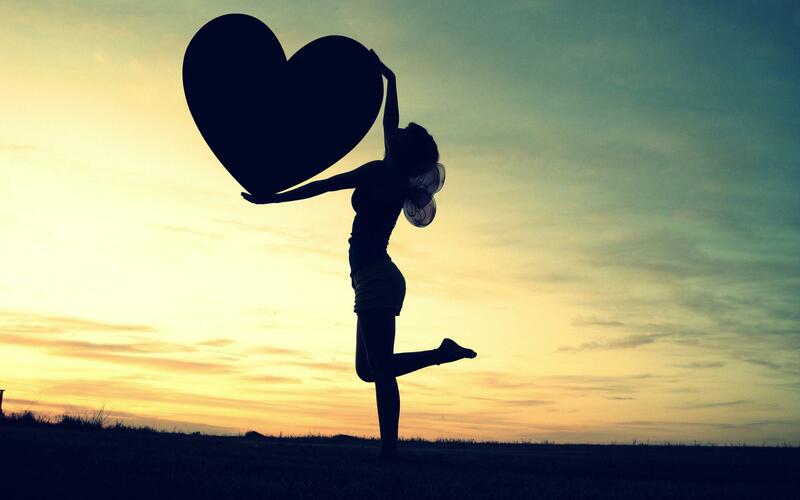 I refuse to let everything drag me down when I have so much love and support that I can count on. And don’t worry. There is still plenty to write and complain about. But today I am going to live in the moment. I will continue to remind myself to approach each day with ease and joy. Sometimes it’s easier said then done but I will keep on trying. I received this in an email yesterday from Dr. Susan Love’s Research Foundation. Leave it to Dr. Susan Love to bring together Susan G. Komen, the Young Survival Coalition, and the Dr. Susan Love Research Foundation to collaborate on the collateral damage and side effects of Breast Cancer as part of the Health of Women (HOW) study. 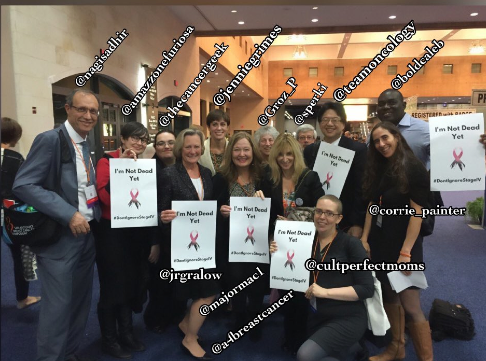 This is so exciting to have breast cancer organizations working together. Dr. Susan Love not only wrote about this concept but she is taking action. 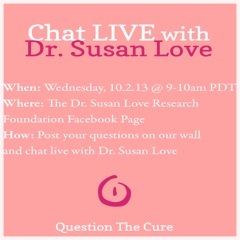 There’s still time to participate with questions in this study so please read the release that Dr. Susan Love sent and get all of this great information including how you can join the conversation with Dr. Susan Love on Facebook, Wed October 2 at 9am Pacific Time and/or Twitter at 1:00 Pacific time. We’re pleased to announce the groundbreaking collaboration of three breast cancer powerhouses to document the short- and long-term physical and emotional side effects of breast cancer treatments as part of the Dr. Susan Love Research Foundation’s Health of Women [HOW] Study. 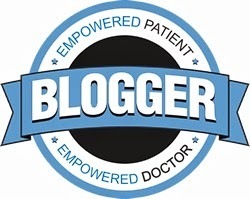 Those of you who have been following Dr. Love’s recent blog posts are aware of the outpouring of interest in documenting the collateral damage of today’s breast cancer treatments and many of you have already participated by providing key questions about your own experiences. More data needs to be collected to provide the scientific community with the most robust cohort from which to derive and analyze the true cost of the cure. In the spirit of collaboration, the Dr. Susan Love Research Foundation reached out to Susan G. Komen and Young Survival Coalition as well as other advocacy groups to ask for their help in spreading the word. Susan G. Komen and Young Survival Coalition have agreed and are inviting their constituents to share their experiences with collateral damage from treatment and to participate in the HOW Study as a means of identifying the causes of, and prevention strategies for breast cancer. This groundbreaking collaboration also demonstrates that different breast cancer organizations can work together on important issues. We welcome all breast cancer and cancer groups to join us. 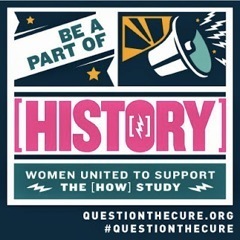 Questions about collateral damage from breast cancer can be submitted through October to http://www.questionthecure.org. Anyone interested in being part of this initiative can register for the Health of Women [HOW] Study and complete the basic questionnaires on personal health and/or breast cancer diagnoses. When the collateral damage module is complete and online, participants will be notified by email. 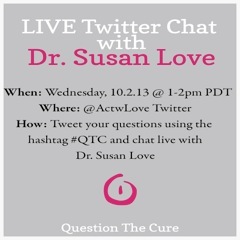 To give you an opportunity to learn more about this groundbreaking collaboration, Dr. Susan Love will host a Facebook chat (Wednesday, October 2 at 9:00 a.m. PDT) and a Twitter chat (Wednesday, October 2 at 1:00 p.m. PDT). Here is a great post from my friend Tami who has MBC (Metastatic Breast Cancer). What I love most about Tami is while she knows the realities of this disease, she continues to inspire as she shares stories about hope on her blog as well as her award-winning book, From Incurable to Incredible: Cancer Survivors Who Beat the Odds. I was also sorry to hear about Angelina’s Aunt who died from MBC. Because there are 113 deaths a day from MBC in the US alone, you can also read an incredible Tribute to Maria Wetzel who also died from MBC the same day as Angelina Jolie’s aunt. We must do everything to continue research that will help those with metastasis stay alive, while we work on ending this terrible disease. Now that some time has passed, I think I can discuss this in a rational manner. There have been varied reactions to Angelina Jolie’s descision to have a double mastectomy after testing positive for the BRCA gene mutation, a hereditary factor affecting a five percent of breast cancer and 10-15 percent of ovarian cancer cases. The cover of People magazine calls it a brave and heroic act. Others call it self-serving and drastic. I just read an article in the Boston Globe, which criticized her for having the wealth and beauty to afford such an endeavor. I really enjoyed hearing Dr. Susan Love speak at the Inaugural Advocate Leadership Summit. For starters it was such a thrill and so exciting to see her after knowing that she went through intense treatment including chemotherapy and surgery for leukemia. I always feel so uplifted when she talks about breast cancer and opens our minds to see things with a fresh perspective. She raised some great points. I took my notes and I hope I am reflecting what she spoke about in the best way possible to help others read what she had to say. She spoke about breast cancer today, and the damage of treatment and over diagnosis. She said with our goal of finding every tumor even those that are just DCIS and have not progressed to cancer, is like the TSA screening. We are in a climate of over treatment where we tend to slash, burn and poison. Then when we have recurrences we have done so much treatment that it could reduce the treatment’s effectiveness. She acknowledges that doctors roles are to find things. Yet 29% of cancers would not kill. Only 20 -30% will become invasive. We over treat and over test. We are in a climate of more is better. We use MRI, PET CT, and Markers. All of this equals finding reasons for treatment. So we do surgery, radiation, chemo, and hormone targeted therapy. Yet we never think of not doing a treatment or subtracting from a treatment plan. We just throw everything we can at whatever we find. She talked about how the oncotype dx and/or the mammaprint test at least looks at whether all of this treatment is necessary. She says none of this is malicious on the doctor’s part. It’s just that no one is looking at the big picture. For example, when patients are diagnosed, they are scared. So they listen to their doctors and do what they are told. But with all of this treatment thrown on all the over diagnostic testing and never subtracting from the treatment especially at an early stage comes in a climate of intense fear. No one is ever told about the terrible toll side effects will play on the patient from all of this slash and burn treatment. There is a huge amount of collateral damage. Having come from doing chemotherapy herself she understands how much this type of treatment takes its toll. Side effects are always down played. No one talks about the effect of AI’s or lymphedema. 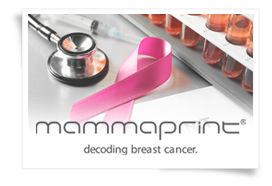 At least the oncotype dx test and mammaprint test looks at whether treatments might work. It would help us to know before treatment, what all these side effects were, whether all of this treatment is necessary and if every case warranted and needed all of this treatment. Also is all this treatment going to be effective or will it just overtax the body and mind? Is anyone looking at the big picture? Can we try to predict if someone will get lymphedema before we rush to do surgery? With radiation there is skin damage. Treatment causes muscles to atrophy. Do we make all women wear a protective sleeve on an airplane? Do we let patients know that when we take breast tissue away that there will be no sensation left in the breast? Do we tell ahead of all the pain from surgery? There is pain from surgery. There is collateral damage from all treatment. There’s numbness, muscle atrophy, skin changes, and heart disease. With all of this systematic therapy all things have side effects. The fatigue and chemobrain lasts for years. There’s heart disease from chemotherapy. Anthracyclines can cause leukemia. These things have lasting side effects. Fertility problems, joint problems, fractures and second cancers…all of these things are real. Treatment is not a free lunch. When someone is triple negative at the beginning they can do well, but statistics show that triple negative breast cancer tends to recur early on. 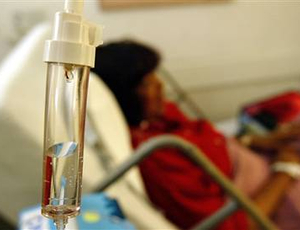 Other cancers tend to recur later while the patients are far away from all of this intense treatment. This is where prevention makes the most sense. If we can prevent the problem in the first place and knew what the real bugs in the breast were at the beginning wouldn’t we be better off? If we understood the environment before the problems took place and we had a vaccine to prevent these problems and we really understood how to keep a normal breast before we rush to all this treatment, wouldn’t that be a better approach? If we really looked at immunology, anatomy, physiology and found new clues and new ways to study DCIS before we rushed to throw everything in the kitchen sink on it, would we need surgery for DCIS? Could 3D ultrasound help with DCIS? Instead of continuing to follow the things as they are, we at least owe it to ourselves to be asking these questions. Instead of rushing to treatment with DCIS would it be better to see carefully what was happening before we put a patient through these treatments that have collateral damage and side effects? Tamoxifen has a lot of side effects as well as AI’s. At least by asking these questions and trying to prevent the problem with a vaccine we would be looking at everything we are doing and starting to come up with new ways of approaching the problem instead of just following the status quo of what we are doing. We need to do this so that we can avoid all of this collateral damage and also have these treatments available in case things progressed before someone has been so over treated that when they present with advanced disease all of this has been used and is no longer effective. I also asked her whether by working on a vaccine to prevent breast cancer could we also apply using this for metastatic disease by injecting someone with a vaccine and being able to turn their disease around? She very carefully admitted that this was not her expertise and that she had just finished treatments, but she did feel that there was nothing to prevent us from trying to make a vaccine that also tackled metastatic breast cancer. Whether or not this is feasible I do not know, but what I did appreciate was hearing her perspective after going through as much as she has been through, and I am so glad that she is part of the team of trying to find answers and look at new ways that we approach this terrible disease. It’s so great to have her back with all of us, after her treatments. She is truly someone who I admire and knows so much about breast cancer and it’s amazing to see her post treatment with so much enthusiasm for getting back to work on all of these important issues revolved around breast cancer. 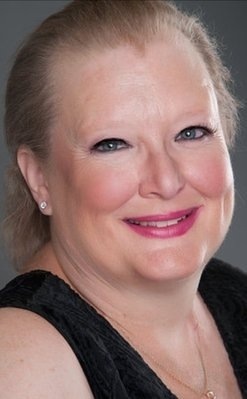 Dr. Susan Love, MD, MBA, FACS is a Clinical Professor of Surgery at the David Geffen School of Medicine at UCLA, and the President of the Dr. Susan Love Research Foundation. She leads the Love/Avon Army of Women, an initiative partnering of women (and men) who are willing to participate in breast cancer research with scientists who are conducting research on the prevention of breast cancer. She is the author of “Dr. Susan Love’s Breast Book,” which is in it’s 5th edition. Dr. Love is a founding member of NBCC and her foundation is represented on the Board of Directors of NBCC. She received her medical degree from SUNY Downstate Medical Center in New York and did her surgical training at Boston’s Beth Israel Hospital. After realizing that some people are not aware of the Oncotype DX test or the Mammaprint test, I went to their websites and here is the current information about the tests. Of course, always discuss this with your oncologist as this is only here to help those that don’t know the latest information about these tests that is available online. The Oncotype DX® test is a diagnostic test that helps identify which women with early-stage, estrogen-receptor positive and lymph-node-negative breast cancer are more likely to benefit from adding chemotherapy to their hormonal treatment. This test also helps assess the likelihood that an individual woman’s breast cancer will return. The Oncotype DX test provides important information that you and your doctor may use when making decisions about treatment. 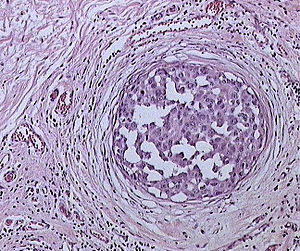 Post-menopausal women recently diagnosed with node-positive, hormone-receptor-positive breast cancer may also be appropriate candidates for the Oncotype DX test.